... picking out patterns... ... for dresses that Mrs. Norman (Melissa’s grandmother) would make for us. We'd pick out the fabric, too. We got to have our very own dresses... that no one else had. And we'd wear them to school... everyday. The year after we graduated (1970) they (the ones that came behind) could start wearing pants to school. We had to wear dresses. We didn't even balk at it. Oh, and we didn't have a school cafeteria. We didn't know better. .... we just brought our lunch to school.... or went somewhere else to eat. That is, if we had a car.... which we didn't. Geez, it sounds as if I lived in the olden days. Well, at the time they were new... and modern... and we were young. ... Back when the year 1984 sounded way off into the future. Wow. 2000 was when I was going to be an old lady. Little did I know that I would still feel like a 'girl' in 2000. ...even though I DO still feel like a 'girl' on the inside. I love reading your nostalgic posts and visioning you and my mom doing these things! And that sign is hilarious. I often think that when I look at an old swimsuit pageant pic, then look in the mirror! Ahh! This was the best blog post of the day, maybe the week! 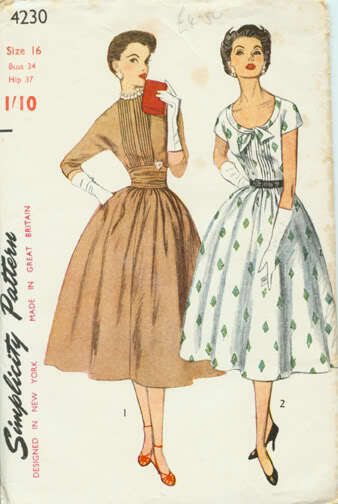 My mother made all my clothes up through Jr. High, and I could hardly wait to have a store bought dress. Little did I know how quickly store bought became shabby, and now I wish for clothes that fit that well and last that long. We had to wear dresses too, and they measured the length with a dollar bill in the center of the knee and up the thigh-- any hem that was above the edge of the top of the dollar and you were sent home to change. We had a cafeteria, and lunches cost 5 cents for all you could eat. Imagine that! I guess we're old, but like you, I feel about 25 still. I felt much older at 29 than I do now in my mid-fifties. that sign is a hoot! I laughed out loud and almost snorted water up my nose. My mom made a lot of my clothes, and I tried too... but I wasn't as successful. I loved looking through patterns and imagining the possibilities though. I loved picking out patterns too w/ my mom! Of course the weren't all dresses but they were unlike anyone else's clothes. Sad to say I probably won't even be able to sew a button on for Eloise.